This Saturday! We’re playing at Bar Sinister! July 30th, Bar Sinister, Hollywood, CA! This is an absolute wonderland dream lineup for us, at our most favorite venue in Hollywood, BAR SINISTER! We hope you will join us for a magical evening of amazing music. 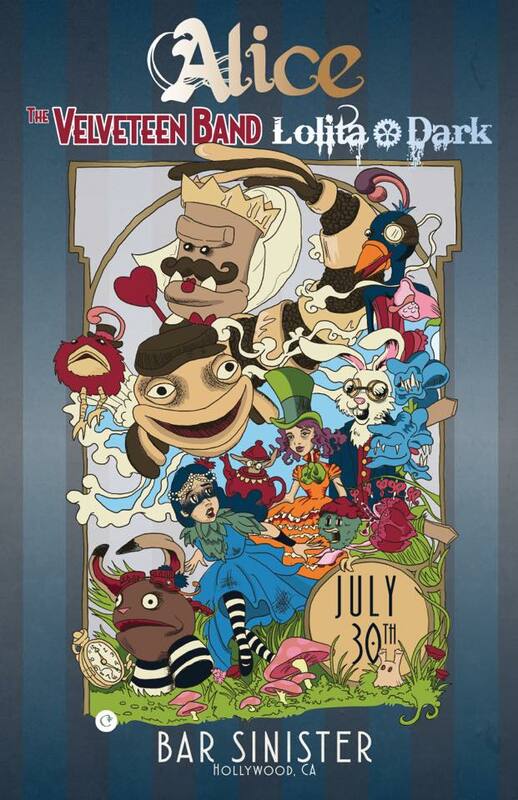 We were so excited about this performance, Claire Flores, puppeteer and artist for the Velveteen Band, spent several months working on the art for the poster. It has elements of all three bands, and we will have a few printed copies available at the show for sale for $5! Previous PostVMCA Showcase 2016Next PostSee you at the VC Fair! I want a poster! That day is Aunt Mary’s birthday. Have a great show.